ART theft may make good movie thrillers, but it seldom gets into the headlines in SA, partly because victims tend to shun publicity. Thefts are reported or insurance purposes rather than in the hope that the stolen work may be recovered. Yet there is increasing evidence that businesses and homes are being targeted for their art collections, and the problem is serious enough for art and antique consultants Gilfillan Scott-Berning to provide a comprehensive service to combat theft of art, antiques and collectables. Owners can register details of stolen items for easy identification, and the firm has a website, www lifewithart.com, on which these can be posted, along with a picture, to alert dealers and auction rooms. "It is only when items are stolen that owners realise they don't have important details for the police," says director Gillian Scott-Berning. "South Africans are extremely aware of the need for good security systems, but not many individuals or businesses realise the vital importance of keeping proper documentation of their collections. "Theft victims seldom have an accurate description of the stolen pieces and can only provide imprecise information. This makes it nearly impossible for the police to trace stolen items, or to locate the original owner when they are retrieved." The firm, which has offices in Durban, Johannesburg and Cape Town, is building up a national database on which owners can register stolen art works, and this is posted on the website. "Internationally, the insurance industry has begun to work closely with organisations providing a register of stolen valuables, and we are hoping to form partnerships and establish links with the South African insurance industry" says Scott-Berning. "We have recently been alerted to thefts of paintings, porcelain, silver and jewellery. There are knowledgeable thieves operating in SA because they know there is little to prevent them selling to anybody who is interested. They often take the television and the VCR to make the theft look like an ordinary burglary. With the police overstretched, they feel confident they will get away with art thefts," she says. "The SA Police Service does not have an art theft unit, but we are working on that". There are also some unscrupulous owners who have made fraudulent insurance claims, she says. South Africans are following a successful precedent overseas (the SAAntique Dealers' Association also runs a listing service). "For years I encouraged owners to list important items with an international service, because stolen items were simply being sent overseas for sale," says Scott-Berning. "The Local History Museum in Durban had a number of medals stolen by a member of staff, and these were sold locally, but because of the importance and collectability of the medals, they soon found their way into the British market. It was as a result of this case that I became involved in the stolen art and antiques issue. Another factor was that foreign registers were becoming prohibitively expensive. So we decided to offer a cost-effective local service." Scott-Berning initiated a workshop on "illicit traffic in cultural property" on behalf of the South African Museums Association in 1995. This raised the alarm bells, which continued ringing when a number of other museums and private residences were targeted by art thieves. Lifewithart.com says it is important that collectors act to restrict the market for stolen goods by practising "due diligence". There should be a thorough check that items purchased or auctioned are not listed as stolen. Details on how to register stolen items are given on the website. Stephan Welz, MD of Stephan Welz-Sotheby's, Johannesburg, says auctioneers don't find theft a major problem. "Ninety percent of items we sell are sourced from clients we know. People who have works stolen usually inform us directly." A recent theft of a collection of "netsuke" - Japanese string holders made from ivory, wood or bone - was reported to the auctioneers by the Cape Town owner. Welz says the public nature of auctions provides something of a safety net. "A catalogue is circulated, it takes about three months for us to sell an item, and we don't pay out for another month. It is almost certain that a stolen item will be identified in that period." He keeps an eye on the Gilfillan Scott-Berning website. Another anti-theft service is provided by the monthly journal, Trace, published in London and circulated worldwide. It also has a website, www invaluable.com. Trace recently helped recover a collection of antique toys, stolen in London and found in Australia when a toy pedal-car offered for sale was identified through the journal. 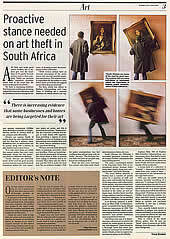 Welz is critical of the South African police, who he says are "blank" when it comes to art thefts. Perhaps Scott-Berning's efforts will soon change that. Our first edition of Business Day Art was a roaring success and there was an over whelmingly positive response from you, the readers. It just goes to show that there is a huge interest in South African artists and their work. And judging from your response, this publication speaks to the many established art investors and those who are on the verge of entering the art market for the first time. There are many ways to support our artists and one could argue that the simple act of visiting a gallery or buying an art work is support enough. In this edition, Braam Kruger makes a case for going a step further and actually becoming a patron of the arts. Not the sort of patron who is visible among the socialites, seen rubbing shoulders with celebrities and. the current hot names in the art world. The real patron is much more than that - a financial advisor, a sympathetic ear to pour your heart out to over a bottle of wine, or a helping hand in a jam. It may be far removed from the bright lights of the art circuit, but there are certainly benefits of being at the front of the queue. I guess once you have identified an artist you wish to support, be it as a buyer or a patron, you would need to look at paying for your latest acquisition. Financing your art work, as HiIary Joffe found out, may not be as straightforward as one would like to think. There are few banks willing to finance art, with many citing the fact that there are no benchmarks against which to measure a work's worth. Unless it is purchased on a credit card or funded through an overdraft, you are likely to receive little help from the banks. It is rather the galleries themselves that are going to be your best bet, with most offering the buyer the opportunity to pay off their latest purchase. With little consideration to credit checks and the like, it seems that old-fashioned ethics has an important role to play in the art world.